Where some people saw nothing more than an unusable, run-down basement, Adam Thomas saw opportunity. Thomas saw the rolling green hills of golf courses that could be played year-round. He saw putting greens and strength training. He saw an opportunity to provide students access to a sport they could play their whole lives, for business and for fun. Thomas brought all of this indoors to Conemaugh Township Area High School, where he’s an assistant golf coach and member of the CT Foundation board, which is part of the Community Foundation family of funds. Through his work with the CT Foundation, Thomas knew he had a system in place to administer fundraising and project costs. And because the fund qualifies as a 501(C)(3) through its CFA affiliation, his project was able to apply for funding from other foundations. The Conemaugh Township Golf Fund that Thomas set up through the CT Foundation also paves the way for permanent oversight. With every indication that the golf facility will be self-funding — maybe even profitable — he believed it was important to have transparent, sustainable accounting. A supportive school board, involved business community, and lots of penny-pinching helped the project come together quickly. Thomas, who owns two local businesses himself, reached out to fellow business owners, and raised $25,000 pretty quickly, plus another $7,000 or so in donated goods and services. An uncle in Florida who owns a sign shop provided 100 feet of wall graphics, bringing beautiful outdoor golf courses indoors. It didn’t cost the school district one penny. A student tries golf for the first time. The facility opened last fall, and almost right away disaster struck. Again, Thomas saw opportunity, and parlayed flood damage into upgrades. It reopened last week, to enthusiastic students. At least 200 of them waited in line for tours on the first day. Many of them tried golf for the first time. Many of them will be back for more. The new facility has two parts. 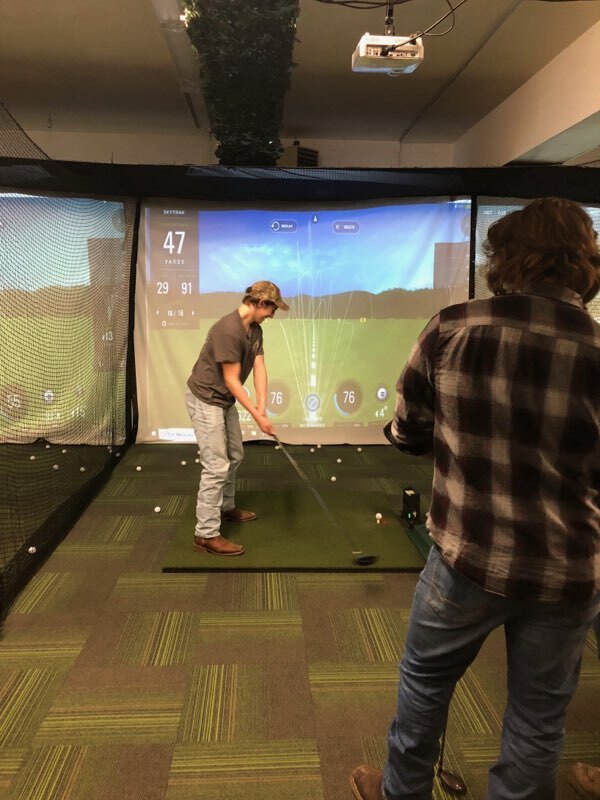 Indoors, there’s a large room with five golf simulators that offer virtual driving ranges, 18-hole games, and swing analyses. Each of those simulators can be converted into a 12-foot movie screen, and a bank of leather armchairs creates home-theater comfort. 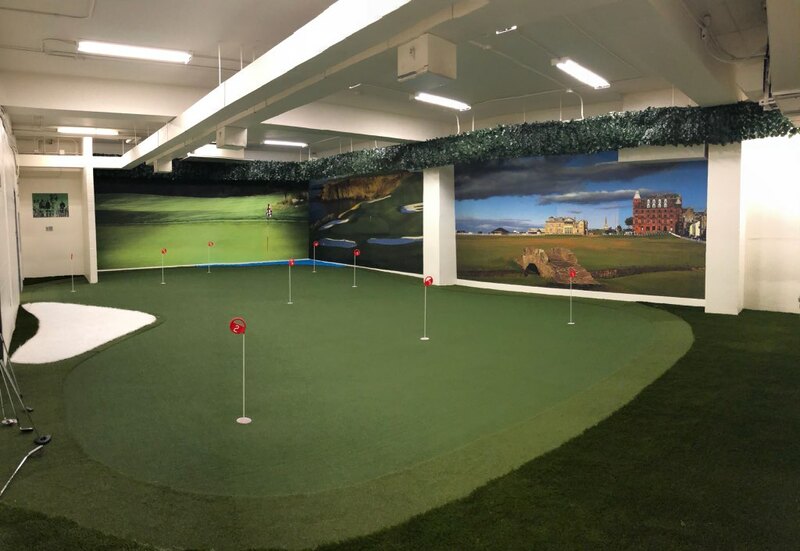 Another indoor space is landscaped with a large indoor putting green, so students can work on their short game. 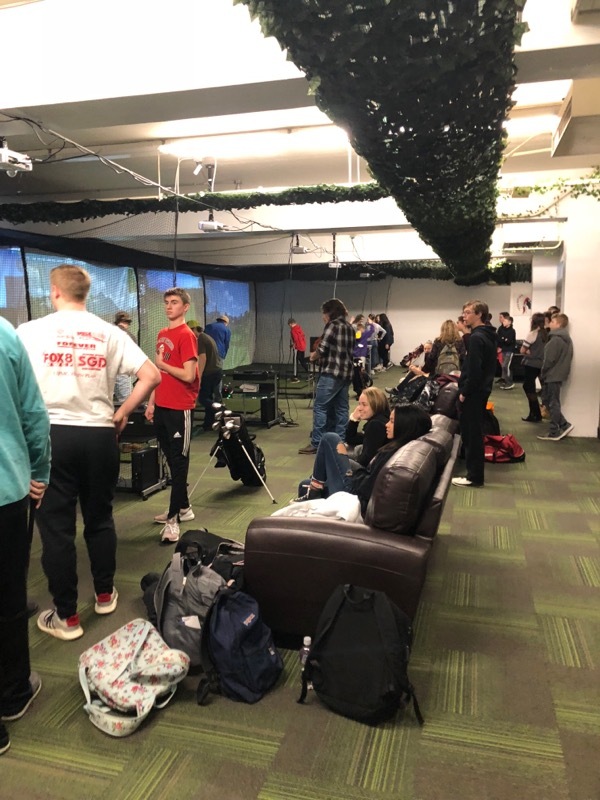 An adjacent room offers a core strength and flexibility studio, which is already being shared with the sports medicine students. Soon, other physical education students and students with special needs will be using it, too. 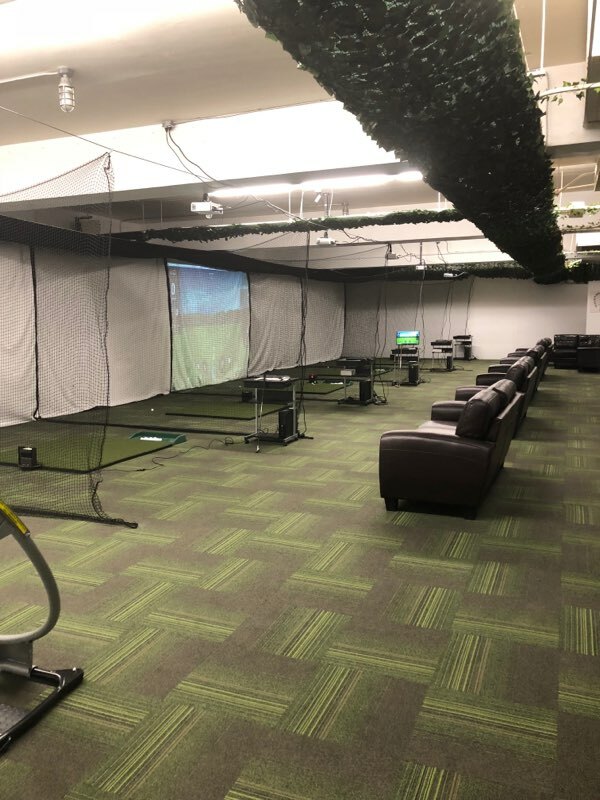 Virtual golf bays can double as movie screens. The high-tech indoor game is supplemented by a new outdoor putting green with nine 100-yard tee-boxes, for a 9-hole game of golf. This green is open to the public, and Thomas says it’s not uncommon to see people out there with their grandkids on weekends having a good time together. Golf isn’t just fun in the sunshine. It’s a path to college scholarships for boys and girls, but girls in particular. With two daughters in the golf program — one of them the high school’s top golfer — that’s something Thomas is tuned into. Last year he added a golf club to the middle school, and now has a total of 48 golfers in the CT program, plus agreements with other coaches that kids can golf even if they’re committed to a different sport. He’s made it as easy as possible for young people to pick it up.